Russia’s city of Yekaterinburg was in the centre of all the table tennis maps last week. Beside elite tournament, GAC Group 2014 ITTF World Tour, Airports of Regions Russian Open, Yekaterinburg was the place for the meetings at the highest level. Next European Championships (2015) will be held in that city and once again highest ETTU representatives, ETTU President Ronald KRAMER and ETTU Secretary General Richard SCRUTON visited Russia. Always ready to go one step further, in the name of the host city Alexander ZAKHAROV, presented one innovation. 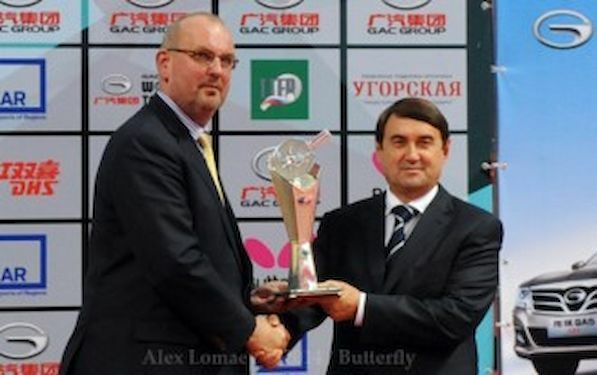 “Alexander ZAKHAROV, the leading man behind UMMC in Yekaterinburg, has taken the initiative of producing a silver cup with the ETTU logo on it to donate to ETTU. In a meeting with representatives of the Table Tennis Federation of Russia (TTFR), UMMC and ETTU’s President, it was decided that this cup will be awarded to the host Association of the European Championships, which will hold and display it during the European Championships. At the closing ceremony of the EC the Cup will be presented to the next organising Association”, announced President KRAMER. The official presentation of the Cup that honours the organisers of the European Championships took place on Sunday in Yekaterinburg. “Mrs. Yana ZAKHAROVA officially and publicly presented this cup to me, and I handed it over to the President of the Board of Trustees of TTFR, Mr. Igor LEVITIN. Next year it will pass on to the Hungarian TTA and so on. So each organising Association will have it for one year, similar to the Egypt Cup in ITTF. Every year it will be engraved with the country’s name and the year of the Championship. So the first engraving will read: 2015 Russia. It was decided to call this cup the President’s Cup,” explained President KRAMER.